Every now and then you read a book that changes your life. It doesn’t happen often, but it happened to me this weekend as I read ‘Building a Discipling Culture’ . This book answered questions I’ve had for some time about discipleship, evangelism and how the church should function. Aside from giving me answers, it also challenged me in a huge way. Let me see if I can share some of my impressions with you, though there’s no way I can do the book justice in one post. The first part of the book offers a fresh and biblical view on discipleship. This part was incredibly challenging, because author Mike Breen states that the church in general has a huge discipleship problem. Jesus’ last instruction for us wasn’t to build the church, it was to make disciples. And we have failed miserably in these last decades. Breen offers his view on the crucial elements of a discipling culture: the appropriate mix of invitation and challenge, just as Jesus offered Hid disciples. A lot of churches have become way too comfortable, too cozy and soft. They don’t offer a challenge anymore. A second aspect of a discipling culture is creating a culture to learn, for disciples are literally mathetes, learners. Too often, we only offer ‘classroom style learning’, a passive fact-based learning style. But to truly learn, people also need apprenticeship (learning from watching a master) and immersion (having access to the culture you are hoping to shape you). If we only teach discipleship using one learning style, people won’t learn and become real disciples. A discipleship vehicle: Breen proposes a huddle, sort of a small group but with some important differences. It’s a closed group of 4 to 10 people you meet with regularly to intentionally disciple them. The goal is for them to start huddles of their own. People need access to your life: this is the immersion and apprentice part. You have to share you every day life with your huddle members. A discipling language: a common language is an important, if not crucial part of a culture. If you want a discipling culture, you therefore needs a language that supports it. And that may not be the ‘Christianese’ church language that is used in many churches. The second part of the book explains this discipling language Breen talks about. He states that our modern culture is very visual, our brains store large amounts of information, stories and data by attaching them to images. He (with others I assume) has therefore developed a ‘language’ of eight shapes, called LifeShapes which each show a different aspect of being a disciple. They have to with things like a sustainable life rhythm, spiritual growth, prayer, spiritual health and evangelism (note that I’m using my own terms here and not Breen’s, as they would take a bit long to explain). He explains each of these images and concepts in a chapter. So why was this book so life-changing? Because it put into words what I’ve felt for a long time, but couldn’t identify: that discipleship wasn’t working. I’ve seen it fail without knowing why. I’ve also seen the examples where it did work and interestingly enough, these were situations where a lot of the elements of a discipling culture were present. It was also challenging, because what Breen proposes isn’t easy. It’s not a just-follow-the-program kind of thing. It requires a huge commitment…but one that got me energized to get started. Also, there are some pretty radical standpoints in there, for instance on leadership. Breen shows Jesus using a variant on situational leadership and challenges us to do the same. It’s biblical in the sense that Breen constantly uses Scripture as a starting point. He doesn’t make any claims not supported by Scripture. He uses Jesus as the main example for discipleship, but translates what He did to our modern times. He offers practical insights and valuable tips. Especially the last part of starting a huddle is very how-to based, it even has some examples of what a huddle session could look like. It’s all experienced based. Breen doesn’t just offer some nice theory, he’s been actively practicing this stuff for years, including the LifeShapes. I liked the concept of the LifeShapes. I’d have to see if they work in real life, but I can see why a visual aid would help a learning process. There’s tons of great insights in the chapters on the LifesShapes. The way evangelism is described for instance (‘looking for a person of peace’) really resonated with me, as I’m a big believer of joining God where He’s already at work. Really, I could go on. You may wonder if there were no negative issues. Well, I wish the book had been longer. Breen offered very interesting insights that could have used a bit more detail in my opinion. Also, I bought the Kindle version and there were a few nasty typos and other errors. That’s it. 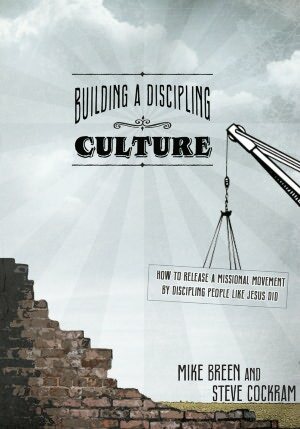 In short: you need to buy Building a Discipling Culture and you need to read it. It will change your view on leadership, discipleship, small groups, the way a church should function, spiritual gifts and so much more. Believe me, I could have written a review twice as long and still not covered all the great stuff in the book. Read it and practice it, it may just change your life, your youth ministry, your church and maybe even the world.